Located just over two hours from the Las Vegas strip, the Extraterrestrial Highway stretches 98 miles, from State Route 318 in Crystal Springs, to U.S. Route 6 near Warm Springs. Also known as State Route 375, this stretch of largely deserted desert was officially renamed in 1996, partially because of its proximity to Area 51, and partially due to the reported UFO sightings along the route. Although it’s a must-do for any X-Files fan, it’s also a very scenic drive and a pleasant diversion, even if you’ve never even heard of Scully and Muldaur. 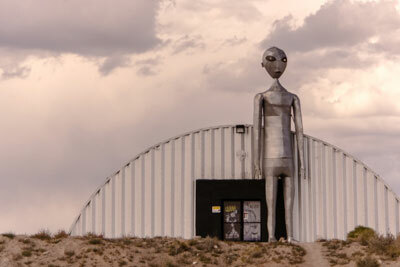 The best place to begin your Extraterrestrial Highway adventure is with a stop at the Alien Research Center, located just north of Crystal Springs in Hiko. You can’t miss it, as there aren’t very many buildings along the route, and the Quonset Hut with a giant alien next to it is easy to spot. It’s only open on weekends, and contrary to the name, it’s just a giant gift shop. 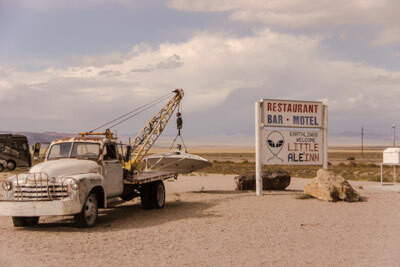 Still, there’s level access to it, and it’s fun to browse through the Area 51 souvenirs. Even if you happen by on a weekday, it’s a good photo stop. 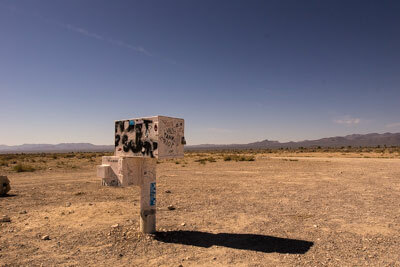 From there, continue along the Extraterrestrial Highway, to somewhere between milepost 29 and 30, where you’ll find the infamous black mailbox. It’s actually been painted white now, and although some people say it’s the Area 51 mailbox, in reality it’s the mailbox of a local rancher. It marks the start of what the locals call Mailbox Road, which is actually the gateway to Area 51. Follow the dirt road for about four miles, until you hit Groom Lake Road, then turn right. From there it’s about eight miles to Area 51. Shrouded in secrecy, Area 51 is also known as the Nevada Test and Training Range. The Central Intelligence Agency only recently acknowledged the existence of the facility, where the U-2 spy plane was developed and tested. It’s also believed to be the testing ground for classified aircraft, and because of all the secrecy surrounding it, some people also believe it’s the place where the wreckage of the alleged Roswell UFO was stored. Of course, that’s just a theory. The one thing that’s for certain, is that you don’t want to cross the base boundary, as it will result in detention and a fine. As you approach the base boundary you will see a camera on one hillside and private security contractors watching you through binoculars on another hillside. 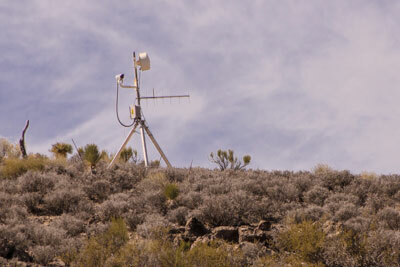 There are all sorts of warning signs, and even sensors to detect a perimeter breach. Indeed they take their security seriously. Still it’s perfectly fine to go to the base boundary — just don’t cross the line. Even if you’re not interested in all the UFO hype around this highly secure facility, the drive out through the cactus forest is very scenic. The dirt roads are graded, but very dusty, and the mountains on both sides frame this off-the-beaten-path route. It’s definitely worth the drive for the scenery alone. A word of warning though — don’t venture into the area if rain is expected, as some of the lower areas are prone to flooding. After you’ve had your fill of military intrigue, head back out to the main road and continue north along the Extraterrestrial Highway. About twenty miles up the road you’ll spot the Little A’Le’Inn (775-729-2515, www.littlealeinn.com), a required stop on any Extraterrestrial Highway excursion. Again, buildings are few and far between on this stretch of road, so it’s hard to miss. Just look for the joint with a tow truck hauling a UFO parked in front. There is level access to this combination diner and gift shop, and the dirt parking lot is level, but there aren’t any striped spaces. Inside, the walls are lined with photos and clippings of the strange goings on in the area. And the owners are happy to chat about all of it. You can also pick up a map to Area 51, an alien coffee cup or even an Area 51 cookbook. It’s a good place to stop for lunch, but plan ahead as the restrooms are not accessible.